Featured Business – Madera Pumps, inc.
Business Name: Madera Pumps, Inc.
Madera Pumps, Inc., was formed July 1977. We’re located on the S/W corner of Ave. 12 and Road 29. Our business consists of irrigation and domestic pump sales and service, including electrical upgrades and repairs, as well as well developing. We have a machine shop specialized to our needs and to do custom work for others. Our service department is on call 24hrs a day, seven days a week. Our clients include farmers, home owners with their own domestic wells, business’s with their own pumps and wells, city pumps, county pumps, irrigation districts, canal companies, etc. Any one who has pumps, deep well, domestic, ditch pumps, all types. 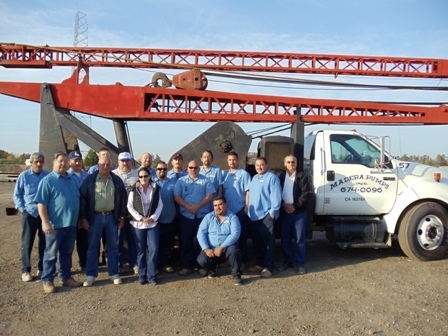 Madera Pumps, Inc. is a family business owned by Johnny Deniz and Sam Pistoresi. We’ve upgraded our machine shop, pump testing procedures, equipment and work force. Absolutely we’re concerned about water issues. Water is our business. Water is our life blood, we all depend on it. Our water table in the summer mostly is dropping almost daily. Everyone should be concerned about our water issues, not just farmers. This severe water table problem affects everyone. The environmentalists are intentionally killing us with their supposed concerns for fish and other wildlife. We need to vote out these two faced politicians who lie to the voters about how they are going to get us more water during their campaigns and then vote with environmentalist against our water problems. One of them is a congressman in a neighboring district who in the past voted against all of our water issues and then ran a campaign about how he was for getting us more water. Our west side is dying because of these two faced liars who vote with the environmentalists. If we are to survive we need to be a little more astute at the voting places. We need more dams to catch the runoff water and we need them now! With more surface water we can stop the drop of our water table!